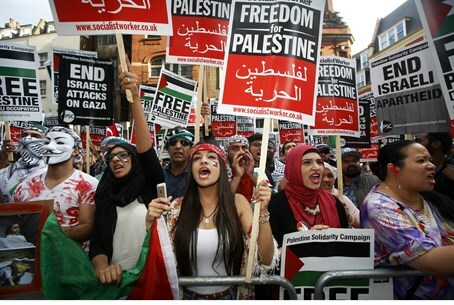 Anti-Semitic attacks on Israel have risen dramatically during Operation Protective Edge, and two recent incidents in Canada show that despite the government's support for the Jewish state, there is much vitriol against it among leftists and Arab Canadians. At the height of the operation Canada's National Post published an article focusing on Canadian lone soldiers. Nefesh B'Nefesh reports that 145 young Canadian citizens are currently serving in the IDF as lone soldiers, living by themselves in Israel and defending the Jewish state. In response to the article, Arab Canadians and radical leftist groups called for the Canadian law preventing citizens from leaving the country to join terror groups to be expanded to include those leaving to serve in the IDF, in a shocking equivocation of Israel and terror, reports Shalom Toronto. The delegitimization campaign comes as the Arabic-language Toronto-based paper Meshwar published in one of its recent editions a photo-montage picture. In it, Prime Minister Binyamin Netanyahu is presented as a vampire, murdering and drinking the blood of a Palestinian Arab child. A Star of David is seen on Netanyahu's forehead in the image, and in front of him is set a picture of a wounded Arab child, bleeding and crying. Blood is seen dripping from fangs in Netanyahu's mouth, as he is shown pouncing on the infant. "He can't satisfy himself with what he already has. Save the Palestinian children," reads the text with the slanderous image. The inaccurate reporting on Operation Protective Edge has led to a surge of anti-Semitic incidents worldwide; a recent study found such incidents rose 383% last month as compared to the same month last year. It is worth noting that the editor of Meshwar, which is a free paper distributed in the streets of Toronto for the local Arab population, is a member of the "Palestine House." Issam Al-Yamani, director of the "Palestine House," spoke at a July 30 anti-Israel rally in Toronto, where he called for a third intifada terror war against Israel, waged both from within the Jewish state as well as worldwide. While the Canadian government has firmly supported Israel, recently denouncing a UN Human Rights Council (UNHRC) committee to investigate allegations of "war crimes" in Gaza, a Canadian law professor, Prof. William Schabas, was nominated to head the committee. Schabas has a proven track record of bias against Israel.